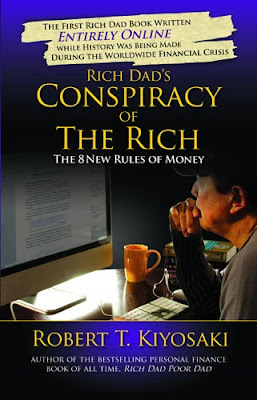 The Guide to Get Rich: Conspiracy or Not... Something is Wrong! The book of the week was Conspiracy of the Rich by Robert Kiyosaki. Yet another book from the Rich Dad series. I am a big fan of all of them, even though some seem to be over idealogical. But sometimes that perspective is exactly what we need. This book is great and ever since I finished it I have been really fired up. The word 'conspiracy' is really strong, but looking at the way the world works today, it might not be far from correct. I feel that money is silently stolen from me everywhere I look. The two major components of this are: taxes and inflation. Then you have the US banking system. A system that George Washington and Thomas Jefferson opposed. And that's because the system is seriously flawed and has terrible ramifications (some of which we have seen recently.) Quote from the book- "In 1971, President Richard Nixon changed the rules of money, without US Congress approval he severed the US dollar's relationship with gold." When Nixon did this we were no longer backed by gold, but instead... debt. We started operating our country in terms of derivatives. Our banking system is so off-kilter. Fractional Reserve Banking... When we go to the bank an deposit money, they can use 10 times that much money to loan out. They loan out money they don't even have! And this is why banks have collapsed recently... It only takes a handful of people not able to pay back the invisible money you lent them in order to make the stack of cards collapse. Now,you want to talk about some great government oversight... We have heard a lot about Bailouts lately. Bailouts are so ridiculous. Only big banks get bailouts... because someone decided they are "too big to fail".. And while the people that have money invested in these banks that are "too big too fail" get bailed out and get every penny of their money back, the people that invested in a smaller bank that collapsed are limited to getting the FDIC payout of $250k. If anyone had more money than $250k in that account... well it's gone. So where do you think these congressmen have money... the ones that decide what banks are "too big to fail"... probably not at the local small town branch. Additionally, The Federal Reserve is not a Reserve and it is not run by the government. In recent years, the Fed is just a printing press. Lately, the Fed is so afraid of deflation they have been trying to fight it with inflation... and so they print.. and print... and print. One day soon it will catch up to us... and I hope everyone is prepared when it does. Lastly... Education. Why is it that nearly no one just out of high school in the US knows anything about finances. I would venture a guess that only .001% of the US could fill out a balance sheet and an income statement. I think the US school system is severely flawed. It teaches nothing about financial education. In fact, it teaches math, science, art, but not cash flow, capital-gain, and cost-accounting. I leaned a lot about calculus and fetal pigs, but I wish I would have learned about something that would make me money. I am a product of the public school system... with a curriculum approved by government officials. If I went to a upper-end private school system I would have learned about cash flows and capital-gains. I would have had entrepreneurship classes and a specific financial education class. Kiyosaki believes that the public school system is designed to teach people to be workers and ignorant toward financial education. I'm inclined to believe him. We are taught to invest in 401(k)s and go to school to get an advanced degree to specialize our education. Well, it seems if I do that I'll become a doctor and I'll be taxed at a higher rate than anyone in the world. Uploaded by gaijinhito. - News videos hot off the press. There are two teams.. the super-rich that pay no taxes and have complete understanding of financial systems and the working class America that suffer from the underhanded doings of the first group. And now...I will step off my soapbox. I just wanted to bring these items to light because it is important you understand the other teams offense in order to implement a solid financial defense for yourself. Invest in cash flow properties, sell options of paper assets, own portions of companies and more than anything invest in your own financial education by reading and going to seminars. It doesn't matter how old you are... Harland Sanders started franchising KFC restaurants at the age of 65! The book has a lot of information. On top of what I discussed here, Kiyosaki discusses what areas you should invest in and other areas of financial education that everyone should be well versed in. If you have any questions on the book don't hesitate to ask. I would be more than happy to help anyone that wants it.